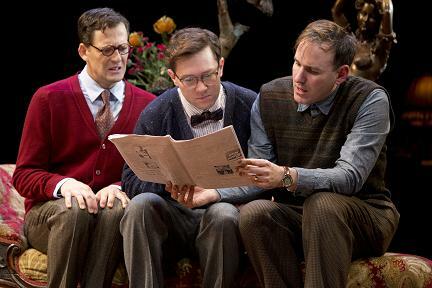 Theater reflects who we are in broad strokes and microcosms. Our identity as a people can be seen in the diversity on our stages. This year we’ve been introduced to many American families. The Profane brings us two Muslim-American families in a powerful version of the old theme of star-crossed love. Zayd Dohrn’s play depicts conflicts between secularism and adherence to religious traditions. It also reveals how practitioners on either path are ultimately assimilated into America. It is who we are, a nation of many different faiths and backgrounds. If I Forget presents a similar dilemma of identity for a Jewish-American family, for whom the crisis centers on an allegiance to Israel. Sweat, Lynn Nottage’s take on the working classes, gives us another glimpse at what defines America. The Pulitzer Prize winning drama, which closes today at Studio 54, focused on laborers in a Pennsylvania factory; united by work, but still divided by race. America still has not found its post-racial moment; perhaps now more than in the previous nearly dozen years, it is less likely to reach that ideal. A portrait of William Shakespeare, Christopher Marlowe‘s better known contemporary. Politics and drama are disparaged, especially by those who feel the sting of the tragedies presented. Sometimes, even if the message is on point, the admixture has an oddly inappropriate tastelessness. Nonetheless, as I have often said, it is the role of art to clarify matters and comment on our foibles and the errors of our ways. We are often led astray on the roads of life, so we should be grateful to plays, playwrights and the traditions of our theatrical history for helping to put us back on track. Tamburlaine in triplicate or triptych: played alternately by North Korean President Kim Jong-un, Vladimir Putin and the US President, with Benjamin Netanyahu coming in as a pinch hitter. In the movie version of the shenanigans surrounding the recent election– the movie from my youth– the big guy is carted away in cuffs. Also, the good people of Montana go to the homes of every single Jewish family that was targeted by Richard Spencer’s crew to make sure they are protected. This is so because in 1950’s America Americans played by the rules, were patriotic and did the right thing. June 25th addendum: The toddler in big boy pants whose got DC as his playpen may be onto something. He doesn’t care for poor folks (note to those who helped elect him–be careful what you wish for is a real thing). Is there a reality show called Lifestyles of the Poor and Unknown? From The Wheelhouse Theatre’s production of An Enemy of the People, playing through June 24th. Photo by Jeremy Daniel. Theatricality is a fraught concept. It can just be dramatic and thought-provoking, or it can be over-the-top, dramatic and thought-provoking. Kristen Childs has written a musical that is theatrical to the nth degree. Bella: An American Tall Tale also gives us a little slice of African-American history mixed in with the fable. In other theatrical news, not as dramatic, I believe that Cynthia Nixon and Laurie Metcalf ruined my perfect record of being wrong on the Tonys. Ah well, maybe next year. Politics and theater are getting a bad rep. Actually politics and their practitioners have had a reputation for honesty meaning any means that is necessary, aka I’ll lie if I have to, and theater has always been a forum for exposing truths. Ms. Nixon stirred the political pot a tiny bit in her acceptance speech at the 2017 Tony Awards Ceremonies. Now, it is the mixing of politics into theater that has caused quite the controversy (see what is happening with The Public’s Julius Caesar for instance.) It is unwarranted. Art is meant to comment on our realities. At any rate, one of those realities, Lost and Guided, a play by Irene Kapustina about Syrian refuges in their own words, is on view at Conrad Fischer and The Angle Project, at Under St Marks (94 St. Marks Place, from August 3 through 27th. For tickets, click here. A similar but perhaps more intitmate project is The Play Company’s Oh My Sweet Land another look at the Syrian refuge crisis. The play is due to launch this fall in private homes and communal spaces where people have been invited to host this multi-sensory experience. Those wishing to participate by providing a venue can do so by filling out the questionnaire here. Nadine Malouf stars, perhaps in your own kitchen, in Oh My Sweet Land, a play developed by Amir Nizar Zuabi with German-Syrian actor Corinne Jaber. Shakespeare wrote plays reflecting timely events, for his time and all times. This may explain why The Public is in such hot water over their production of Julius Caesar. The brouhaha, perhaps like the staging, is way out of proportion. In Measure for Measure, Shakespeare also explores issues to do with power and justice. Theatre for a New Audience is presenting a new modernized staging by Simon Godwin from June 17th through July 16th. Tickets for this show which will be held at Polansky Shakespeare Center in Brooklyn are available at TFANA’s website. Henrik Ibsen had his own take on both the personal and the political. For instnace, Ibsen’s drama, An Enemy of the People is a play about populism and its discontents. Following on the success of Ibsen’s feminist tale as revisited by Lucas Hnath in A Doll’s House, Part 2, see the US Premiere of Victoria Benedictsson’s 1887 Swedish original, The Enchantment in a new English translation and adaptation by Tommy Lexen. Ducdame Ensemble introduces us to the woman behind Ibsen’s Nora; Benedictsson, who wrote under the pen name Ernst Ahlgren, was not only Ibsen’s inspiration but also Strindberg’s for Miss Julie. The Enchantment opens at HERE on July 6th, with previews beginning June 28th. Dystopia is the normal atmosphere of an Ibsen play. It is poignantly a main event in the classic 1984. George Orwell’s novel in which Big Brother government controls its citizens has been turned into a play by the same name. 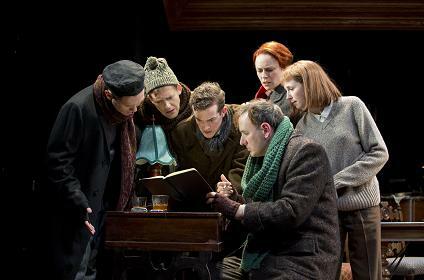 The play by Robert Icke and Duncan Macmillan was first performed in 2013 at England’s Nottingham Playhoouse. 1984 , a place where mind control involves convincing us that up is down, “freedom is slavery,” is now at Broadway’s newly renovated Hudson Theatre, with an opening on June 22nd, and starring Olivia Wilde and Tom Sturridge. World’s Fairs are theme parks for progress. The 1893 Columbian Exposition in Chicago, named in honor of Columbus’ landing in the Americas 400 years before, offered marvels never before seen. The Light Years presented at Playwrights Horizons through April 2nd (opening night is March 13th) finds the personal in this grand historic event. T and B will be there so look for our review of this new work by the experimental troupe, The Debate Society, next week. For more information on the production (and tickets), please visit the @PHnyc website. Acrobats, gymnasts and trapeze artists might be dismissed as circus performers, but their skills are undeniable. Those talents when put in the service of thought-provoking materials rise way above. They are often on display in a Paul Taylor season, and we are fortunate to have the 2017 one starting at Lincoln Center today, March 7th, and running through the 26th. Taylor’s dancers (and the dances he devises for them) thrill and jump with all their heart and soul. There is abandoned precision in every move. Some of the highlights T and B will share this season are Le Sacre du Printemps (The Rehearsal); The Weight of Smoke; Lost, Found and Lost; Syzygy and the new The Open Door, among others. For more information and tickets, please visit the Koch Theater website.